The SDSS uses a dedicated 2.5 m f/5 modified Ritchey-Chretien altitude-azimuth telescope located at Apache Point Observatory, in south east New Mexico (Latitude 32o 46' 49.30" N, Longitude 105o 49' 13.50" W, Elevation 2788m). A 1.08 m secondary mirror and two corrector lenses result in a 3o distortion-free field of view. 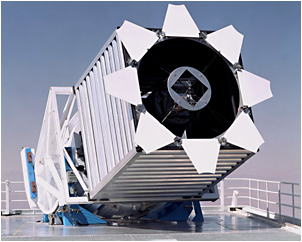 The Sloan Digital Sky Survey (SDSS) is the most ambitious astronomical survey ever undertaken. When completed, it will provide detailed optical images covering more than a quarter of the sky, and a 3-dimensional map of about a million galaxies and quasars. As the survey progresses, the data are released to the scientific community and the general public in annual increments. The SDSS uses a dedicated, 2.5-meter telescope on Apache Point, NM, equipped with two powerful special-purpose instruments. The 120-megapixel camera can image 1.5 square degrees of sky at a time, about eight times the area of the full moon. A pair of spectrographs fed by optical fibers can measure spectra of (and hence distances to) more than 600 galaxies and quasars in a single observation. A custom-designed set of software pipelines keeps pace with the enormous data flow from the telescope. The SDSS completed its first phase of operations - SDSS-I - in June, 2005. Over the course of five years, SDSS-I imaged more than 8,000 square degrees of the sky in five bandpasses, detecting nearly 200 million celestial objects, and it measured spectra of more than 675,000 galaxies, 90,000 quasars, and 185,000 stars. These data have supported studies ranging from asteroids and nearby stars to the large scale structure of the Universe. The SDSS has entered a new phase, SDSS-II, continuing through June, 2008. With a consortium that now includes 25 institutions around the globe, SDSS-II will carry out three distinct surveys - the Sloan Legacy Survey, SEGUE, and the Sloan Supernova Survey - to address fundamental questions about the nature of the Universe, the origin of galaxies and quasars, and the formation and evolution of our own Galaxy, the Milky Way. PhD Thesis Defense, Felipe Marin, "The large-scale three-point correlation function of SDSS luminous red galaxies"
PhD Thesis Defense, Andrew Puckett, " A catalog of slow-moving objects extracted from the Sloan Digital Sky Survey: Compilation and applications"
PhD Thesis Defense, Jacqueline Chen, "The Galaxy Cross-Correlation Function as a Probe of the Spatial Distribution of Galactic Satellites"
PhD Thesis Defense, David Johnston, " Measuring the galaxy-galaxy-mass three-point correlation function with weak gravitational lensing"
PhD Thesis Defense, Craig Wiegert, "Constraining compact dark matter with quasar equivalent widths from the Sloan Digital Sky Survey Early Data Release"
KICP Seminar, Erin Scott Sheldon, "Constraints on Galaxy Biasing from Weak Lensing in the Sloan Digital Sky Survey"